I’ve always admired staircases. Maybe it began way back in the Full House and Cosby Show days?! Remember how both houses had a front and a back set of stairs? I used to always think that ‘when I get my own home, I’m going to have 2 sets of staircases just like the Tanner’s house, too! Or it might have started because of my Grandparents cool long and curvy case. Then again, my aunt and uncle had a basement set that had an open runner on the one side that we used to use as a carpet slide! My cousins and I used to spend so much time on that cool velvety red entertainment! I’ve always been intrigued by the beauty and uniqueness of staircases. I feel like it’s quite often an overlooked (important) detail in many homes. I know when I envision my ‘dream home’ I’d like to build one day, the staircase has always been a huge factor in adding in visual appeal. There are so many beautiful options when deciding to add a set of stairs to your home. We quite often see in movies brides walking down the never-ending huge curved staircase. They are beautiful and definitely a statement piece in any home but not my style. I’m more of a simple ‘L’ or ‘U’ lover! I’d love to have a set that has a landing part way, a cozy little nook with a big window and a comfy bench you can stop and relax on. Kinda like the one below. In my parents home, my childhood home, they have a great wooden staircase. My Dad has made a few changes with it over the years but it still remains simple and timeless. Every year for Christmas my Mom hangs all of our stockings from the railings and drapes garland with lights all along the handrail, it’s really pretty. It kind of makes me forget all about the times my brother and I fell down it as kids!! I remember the first house my husband and I bought, had a great ‘U’ shaped staircase with a window part way up. They had a lot of potential and I couldn’t wait to rip the ugly burgundy carpet off of them! Once the carpet was removed, I painted the risers white, sanded and stained the treads a dark stain and added in a new handrail. When they were finally finished they looked great. Our current 1 story home has a basic boring carpeted staircase to the basement. The kids like it though because there are no spindle posts on the open side so when they go down, they slide on the carpet ‘slide’ and jump off before they hit the post at the bottom! This is usually the only way my boys and their friends get downstairs anymore. Maybe you’re building your dream home or just looking to update your current case. Whatever it is, there are many different options to think about when designing your perfect set. Carpeted or wooden? Painted or stained, or both? Spindle posts, railings, shape….? 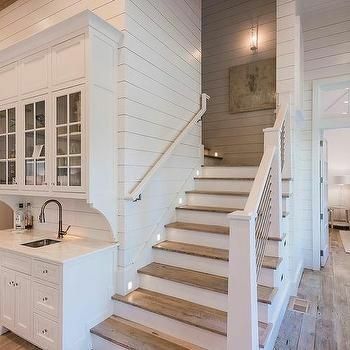 There’s a lot to think about when adding a staircase to your house. Enjoy checking out and getting inspired by these great sets of stairs and send me some of your favourite staircase pics and what you love the most about them! !